Rite Aid Pregnancy Test has two main benefits: it’s easy to use and easy to read! This test has a super-wide absorbent tip that makes taking the test a snap! 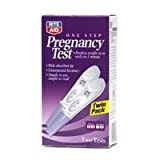 It’s also much cheaper than many other pregnancy tests (especially the digital tests) and comes in package of two, so that is a big bonus as well. On the downside, some users have reported that the test results take longer to show up than they are supposed to. Some said that it took at least 5 minutes for the line to appear, yet the instructions say that any line appearing after 5 minutes is invalid. Although the results turn out to be correct, this can be confusing to some and may cause needless worry. Anyhow, I would recommend the Rite Aid Pregnancy Test.